Ever since I moved South, have wanted to “go to the mountains” in the fall like so many other Southerners do. This year I finally did — and had a fabulous time. Departed from home on Friday morning with four women in my walking Meetup group, including the leader, Rita. 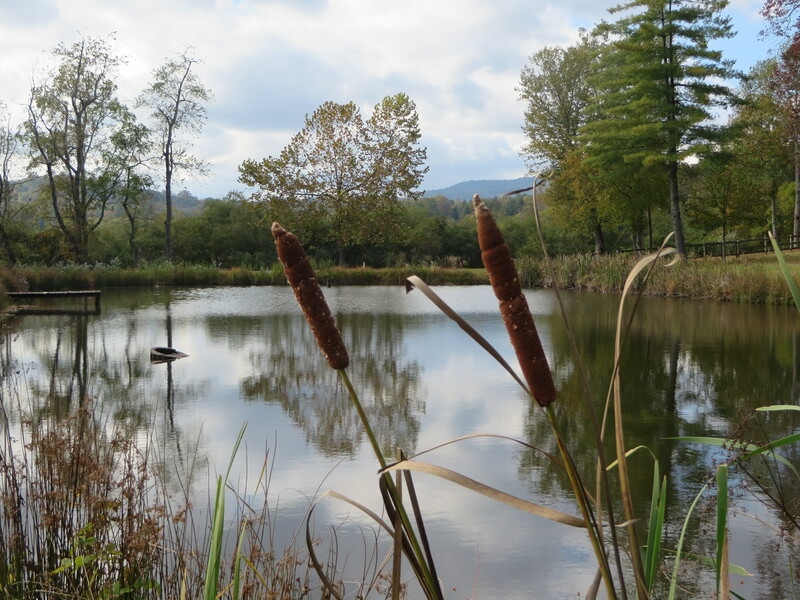 We carpooled to Brevard, North Carolina and stopped for lunch in a charming cafe in a little town along the way — where we were surprised to note that we were the youngest patrons by about 20 years (and we’re all “over 50 – but adventurous” women)! 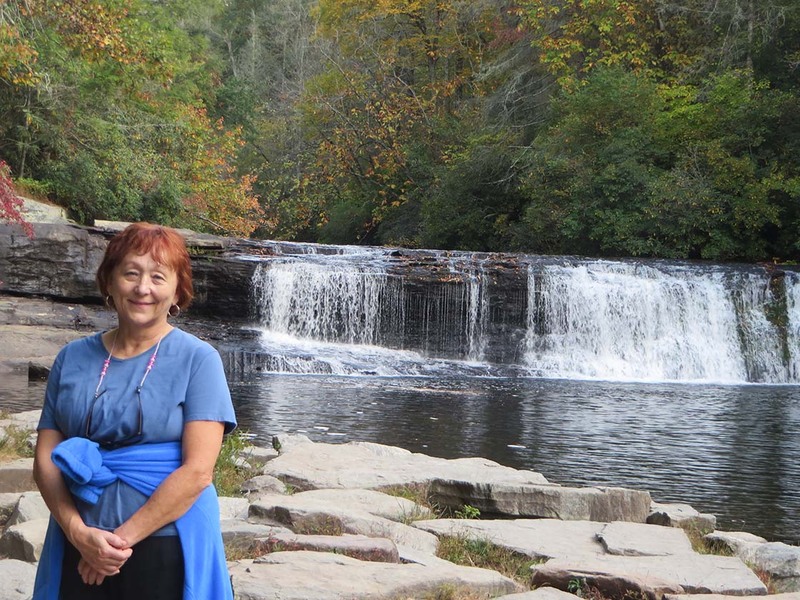 We stopped at our destination — Deerewood Lodge and Cabins — long enough to quickly unload the cars, and then drove to Dupont Recreational Forest located between Hendersonville and Brevard. We met our hiking guide — and her service dog, Yogi, and set out on a hike to four waterfalls. “Wow” is all I can say. The falls were gorgeous and each was very different. The leaves around us were changing colors and the temperature was perfect. 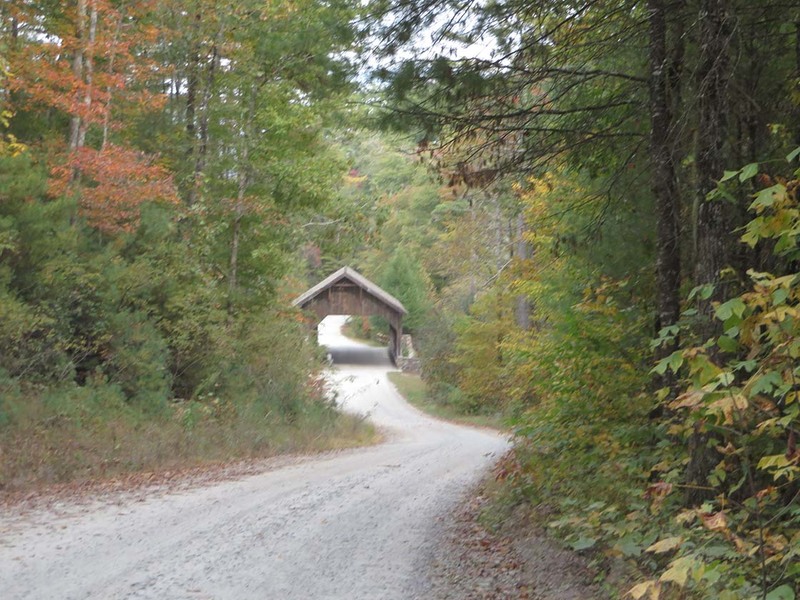 And we saw a scenic covered bridge, too. We got back to Deerewood before dark, and took our stuff to our rooms. 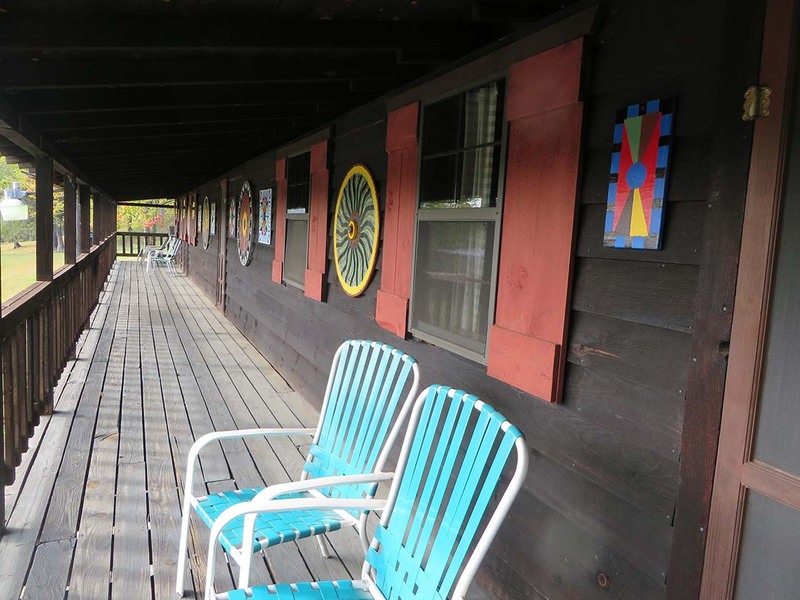 Three of us stayed in individual rooms in the lodge — which was the coolest place ever — and the other two women stayed in separate cabins. 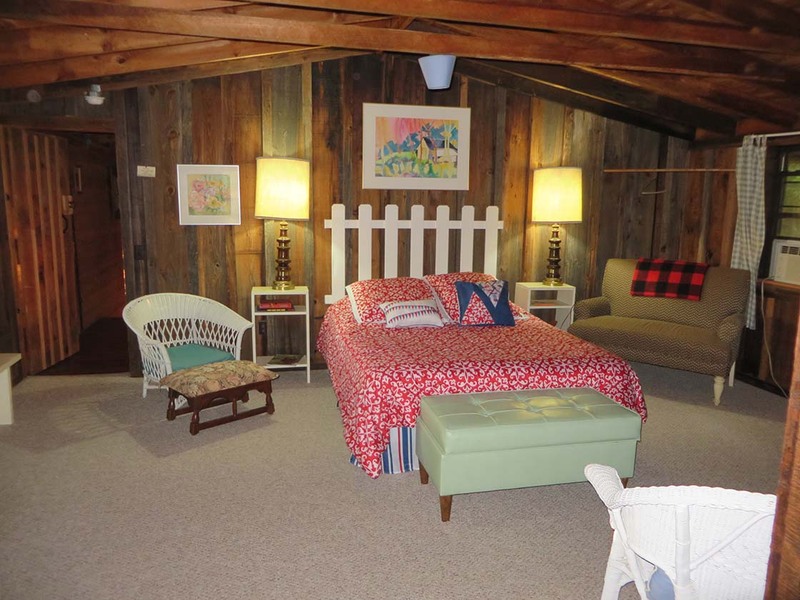 The lodge rooms are rustic and look like the interior of a cabin – but with comfy bedding and convenient bathrooms. 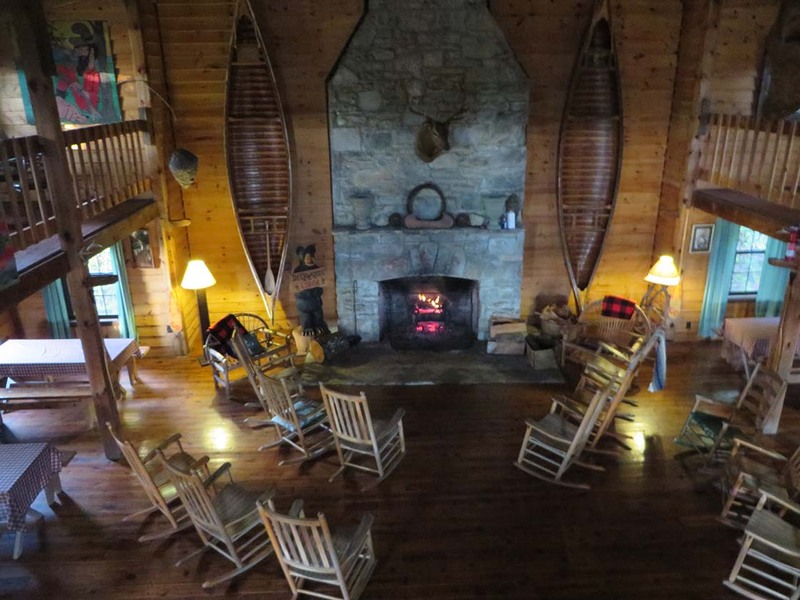 Two long porches with rocking chairs cross the front of the building, and the rooms open up on them. A huge common area has a fireplace (and there was a roaring fire when we arrived), lots of rocking chairs, and a communal kitchen. Native American rugs hang over the railings, big game horns are mounted on the wall — and so are two full-sized canoes! One of my favorite things was the Southwest artwork throughout the property; the owner creates it and it’s funky and fun, making the place truly unique. After breakfast we headed to an outfitter for a guided kayak trip down the French Broad River. The trees were beautiful and the water was very clear — although we did run into some “mini-rapids” which weren’t scary — because if you tipped over, you could actually stand up; the water was so shallow. After paddling downstream for 3 1/2 hours, we finally asked Rita how far we were going and she revealed it was an 8 mile trip, but she didn’t want to tell us that at the beginning so we wouldn’t get discouraged! That afternoon, we chilled out for a while, then headed to downtown Brevard for some shopping and dinner out. The town was cute, with hiking and tourist shops, a large O.P. Taylor toy store — and an old-fashioned drugstore — complete with counter service. We’d heard before we got there about the legend of the white (albino) squirrels in Brevard — and it seemed like every shop sold white squirrel ceramic figurines or stuffed animals; even saw white squirrel lollipops! 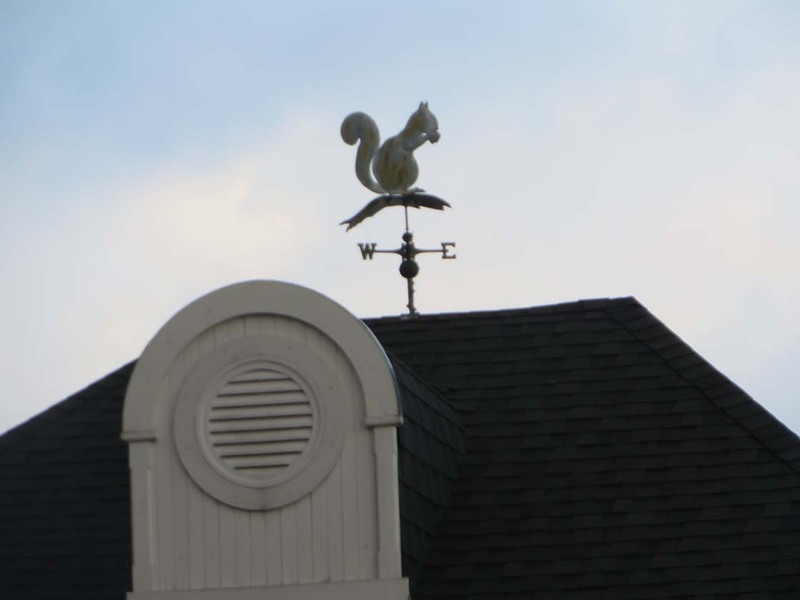 The courthouse weather vane had a squirrel on top of it, and the traffic light pole had a wire squirrel on it, too. But none of us ever saw a white squirrel! We had dinner that night at The Square Root (everyone agreed the food was delicious!) with our hiking guide and Yogi. 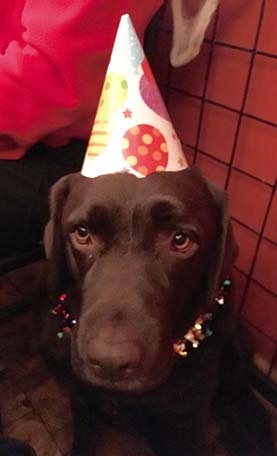 It was Yogi’s 5th birthday that day — so he wore a festive garland around his neck and a pointed party hat — and we put on party hats, too, for a group photo. We sort of made a spectacle of ourselves…. but Yogi got a lot of smiles and pats. The party photos were later posted to Yogi’s personal Facebook page — and he even gave us each a party goodie bag at dinner! 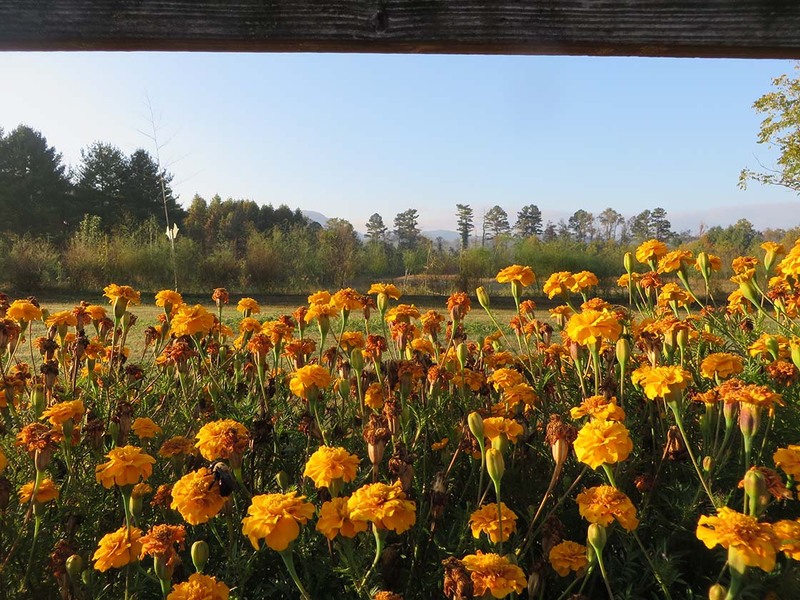 Sunday morning, we took a stroll in the sun around the lodge property and explored a bamboo forest walking trail, climbed up an observation tower, and saw a lot of flowers and fields with mountains as a backdrop behind them. 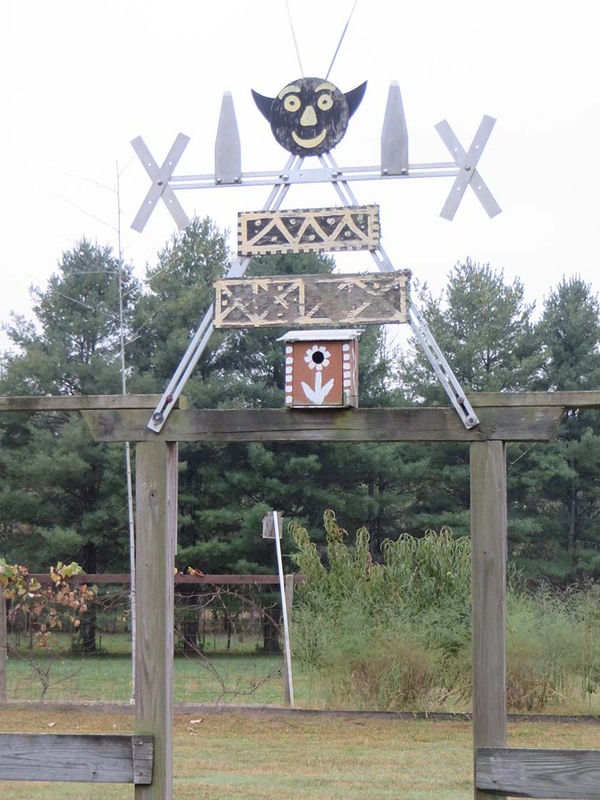 I always rave about Meetup groups, and after returning from the Fall Fun Women’s Adventure Weekend, am more enthusiastic about Meetup than ever! 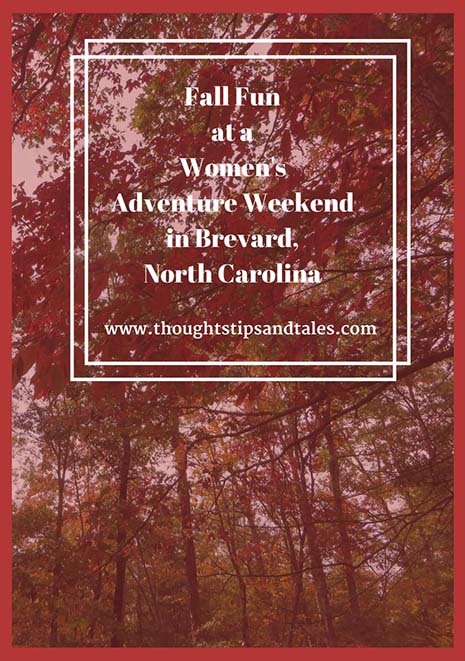 This entry was posted in friends, vacation and tagged women hiking, women kayaking, women's adventure weekend, women's adventure weekend in brevard, women's trip. Bookmark the permalink. Looks like a wonderful time for sure! The leaves are at peak now here in PA and it’s stunning! What a great way to spend the weekend. Glad you had a great time. Thanks; it was so much fun. Better than the hurricane evacuation the week before! I bet your leaves are fantastic! Great capture of a most definitely fun weekend! You’re right — it was really fun! It was! First time I’ve done anything like that – and I’m hooked.